Is LeBron James pulling a Michael Jordan on us? Leaving the game of basketball right around his tenth signature sneaker to take a stab at different sports like beach volleyball and table tennis? No sir, what you’re looking at are the latest shots from the Nike+ Festival of Sport 2012 out in Shanghai, a huge event put on by Swoosh to try to rally the Chinese people around the unifying power of sport. 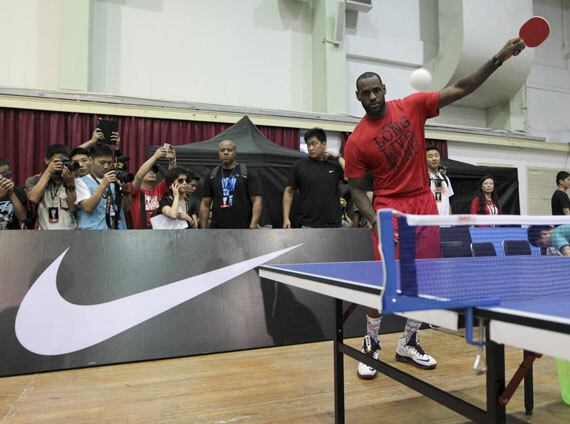 Aside from trying his hand at ping pong LeBron also judged the Nike+ Basketball Vertical Dunk Challenge together with the likes of Amar’e Stoudemire, Rudy Gay and Paul George. Click through for the latest from the festival, including Dunk champ Heng Wang who no doubt got there with the help of the new Nike Lunar Hyperdunk+.